The World Health Organisation (WHO) has declared the Zika virus a global public health emergency. It’s predicted that it’ll affect up to 3-4 million people in the Americas and with concerns over the damaging effect it has on unborn babies, what exactly is Zika, what are the risks and how might it affect you? The Zika virus is spread by daytime active Aedes Mosquitoes found the Americas. The virus is generally mild and self-limiting, lasting 2 to 7 days however of greatest concern is a strongly suspected link with brain defects in babies. It is thought that pregnant women with the virus can transmit it to their unborn child with reports of newborn babies born with microcephaly; abnormally small heads with underdeveloped brains in affected areas. What’s being done to overcome the virus? At present there is no vaccination available. However the US National Institute of Health have two potential Zika vaccines in development, which if successful, could enter clinical trials by the end of 2016. In the meantime authorities are using chemicals to try and get rid of the mosquitoes. Additional measures such as removing stagnant water sources (where the mosquito lay their eggs) have also been introduced. Should we be concerned about it in the UK? According to Public Health England, the risk it poses to the wider UK population is negligible. The mosquito found to spread the virus is not found in this country, and although the virus can be transmitted sexually, the risk of this is ‘very low’. As a precaution however for males who’ve recently returned from an area where the Aedes mosquito is present Public Health England recommends using condoms for 28 days after coming home and for six months if Zika symptoms do develop. So what can people do to protect themselves? What should you do if you’ve planned a holiday to a Zika-infected area? As the Zika virus poses the most risk to pregnant women, only those who are pregnant or intend to be have been advised by the National Travel Health Network and Centre (NaTHNaC) to reconsider or delay travel plans to areas where there is the Zika virus. If travel to these areas is unavoidable, scrupulous insect bite avoidance measures should be taken both during daytime and nighttime hours. 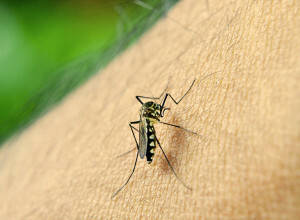 For all other people travelling to Zika-infected areas, precautions should be taken to limit the chance of being bitten (see above). As the risk of illness may be heightened in these areas, ensuring you have a good quality travel insurance policy that provides enough emergency medical cover is equally important. Try our affordable travel insurance today. For more general information about Zika visit NHS Choices. For up-to-date information on affected countries and travel advice visit NaTHNaC’s website.